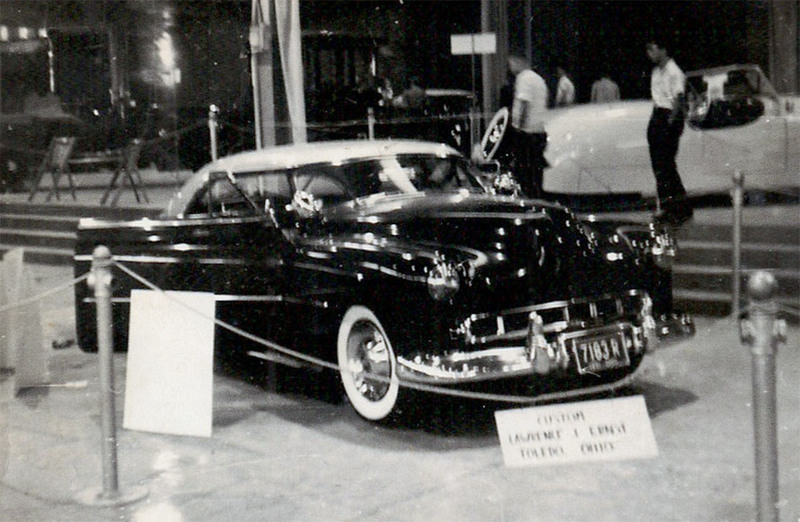 Part two in our photo coverage of the early 1950s Custom Auto Shows held in Indianapolis. 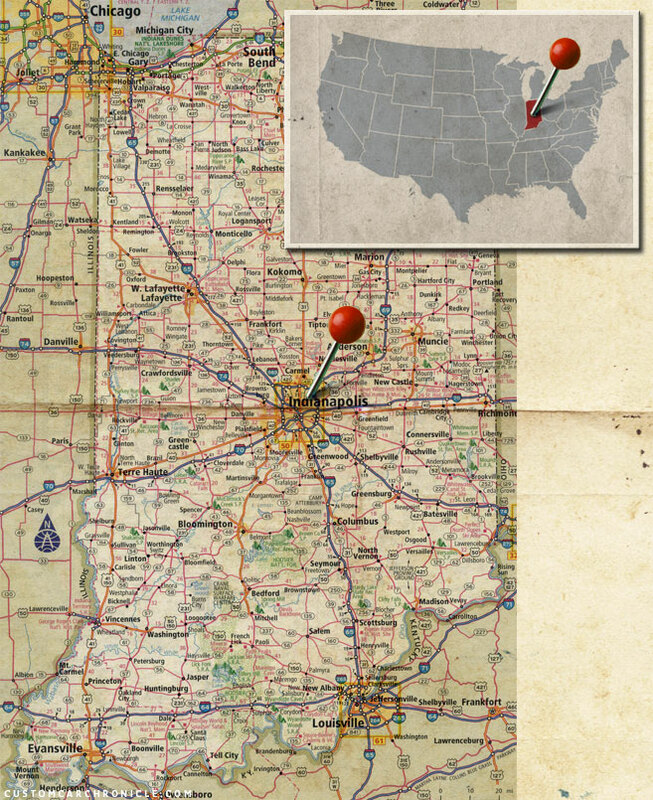 Indianapolis had already a very strong bond with automotive scenes with the countries best known race track. Making a lot of car enthusiast people move to the area, and continue to give input to this scene. 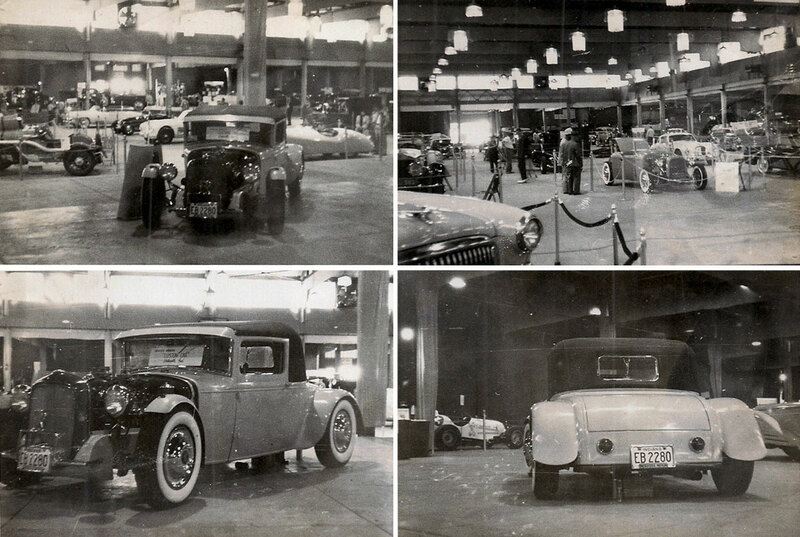 When the Hot Rods and Custom Cars were starting to develop on the West Coast Car loving Indianapolis soon followed. 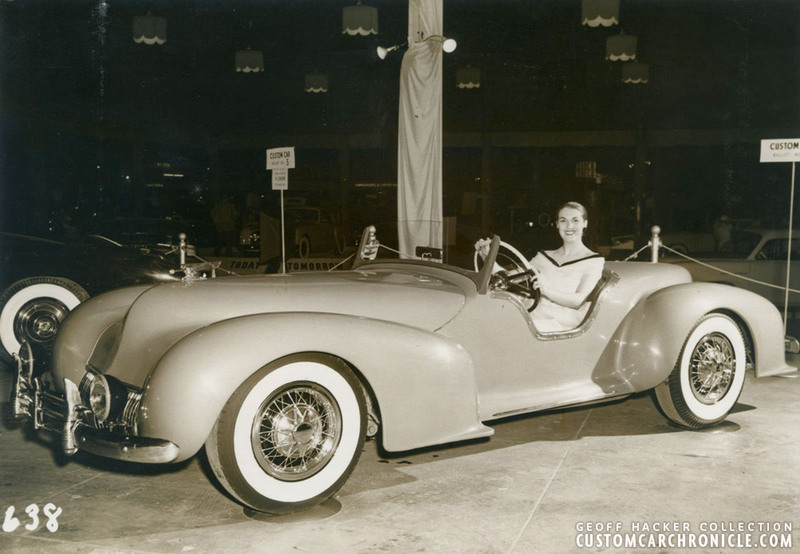 Custom Cars and Hot Rods have always had a tie with the Race Car Scene. So it was no coincidence that one of the bigger and best known shows outside of California would be in this part of the US. 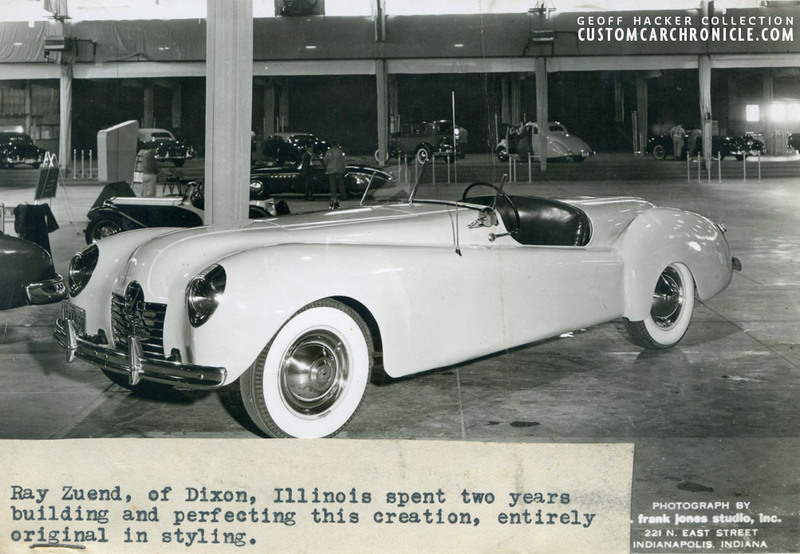 The Custom Car scene was big in this part of the country, influenced by the Californian Custom Car Scene, brought over by cars bought in the west, and of course the early car magazines. 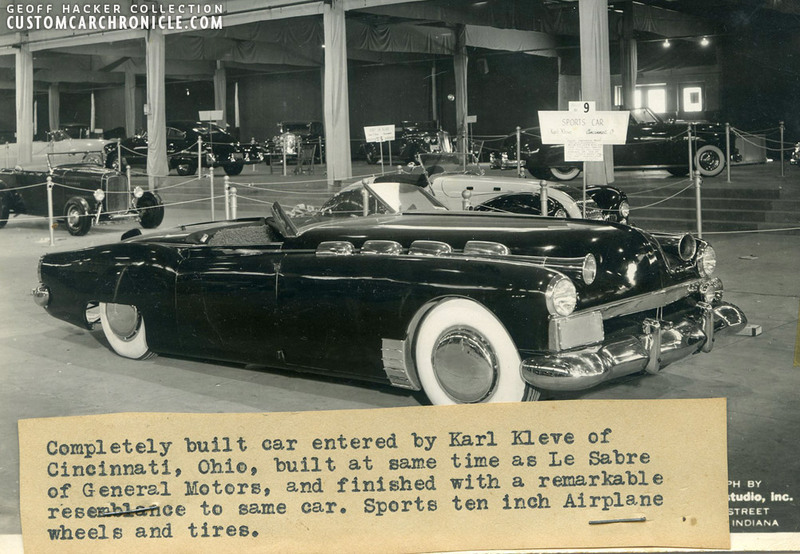 This part of the US soon would develop their own style of cars, both in Hot Rods as well as in Custom Cars. This series of photos give us a great look of this. Special thanks to Geoff Hacker. 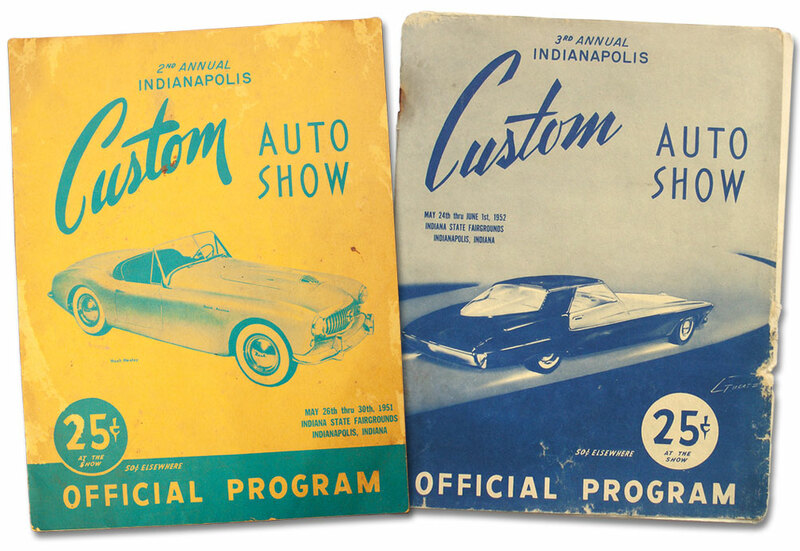 The 1951 and 1952 show programs. Very nicely restyled 1936 Ford 5-window coupe with a narrow grille, painted running boards, De Soto bumpers, teardrop bubble skirts and single bar flipper hubcaps on black wall tires. Jerry McKenzie from Indianapolis was the owner. 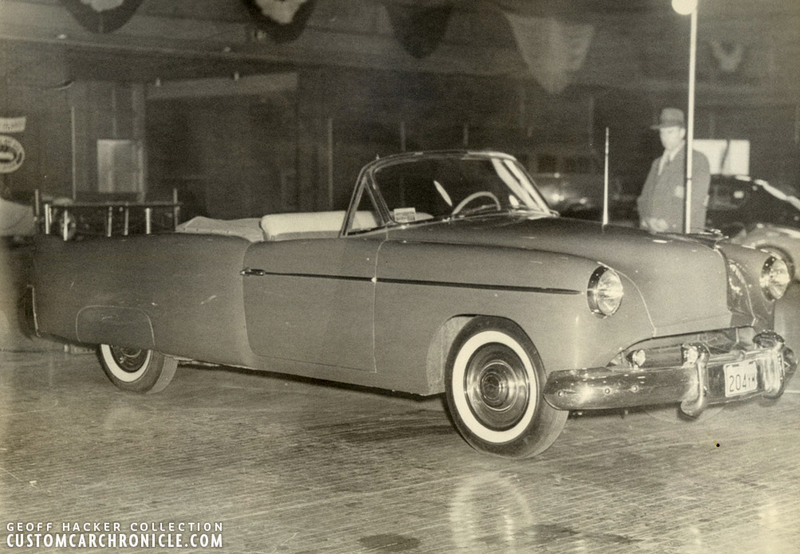 The super nice car had two photos in the Jan 1952 issue of Hop Up magazine. 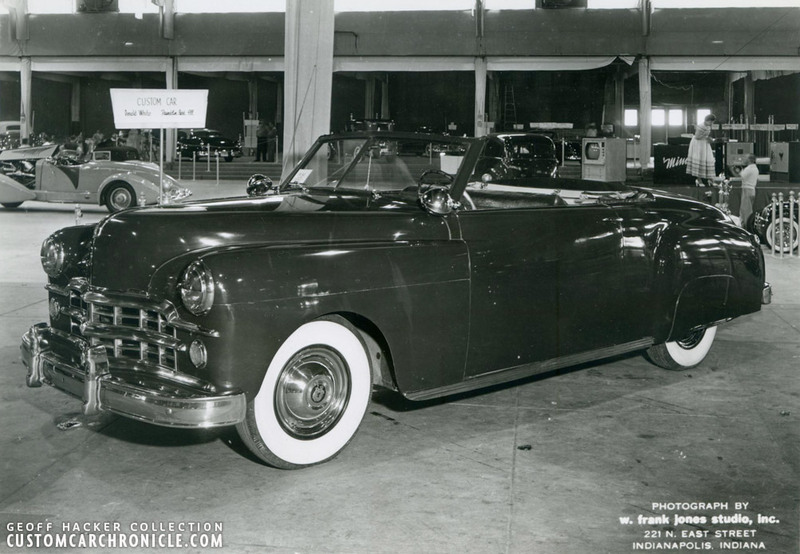 1941 Ford convertible with chopped windshield and padded top with panoramic rear window. 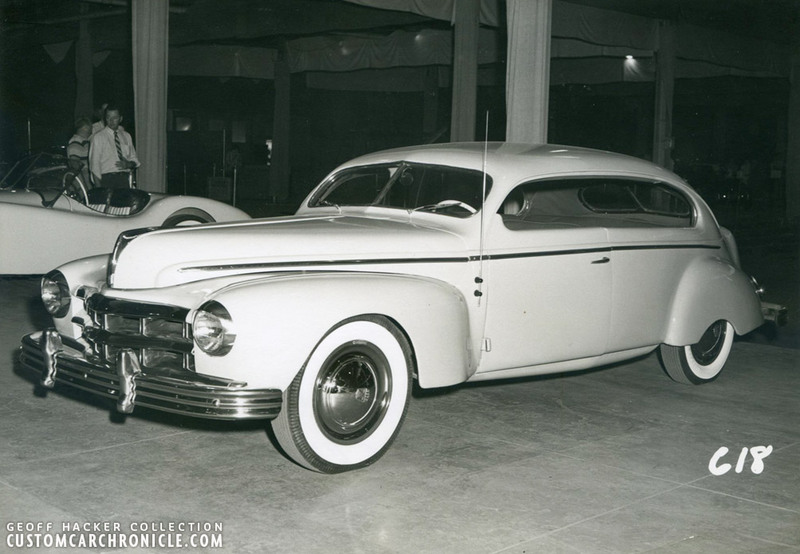 It also features molded fenders, shaved body and filled side grilles with custom made narrow center grille and 1937 DeSoto bumpers. A closer look at the panoramic rear window padded top. 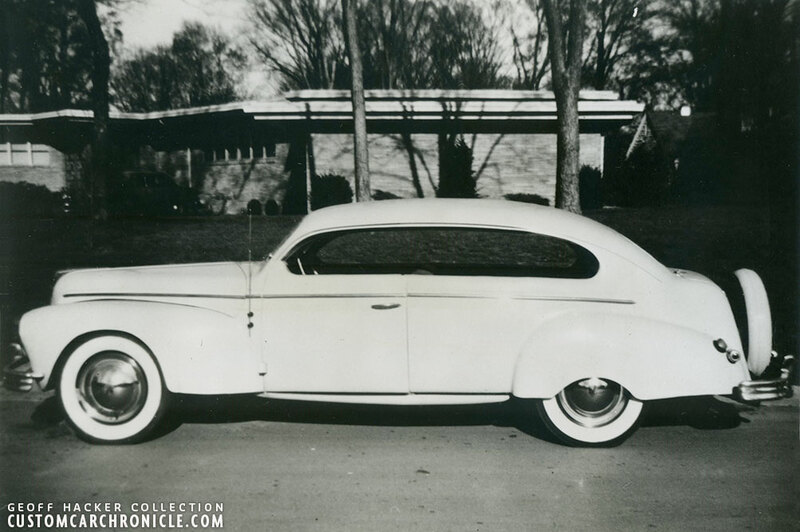 A body shop owner from Springfield, Missouri, started with a 4-door ‘39 Mercury and turned it into a 2-door. He then carried on to section the body, chop the top and removed the center styled to make it a semi Hard-Top. 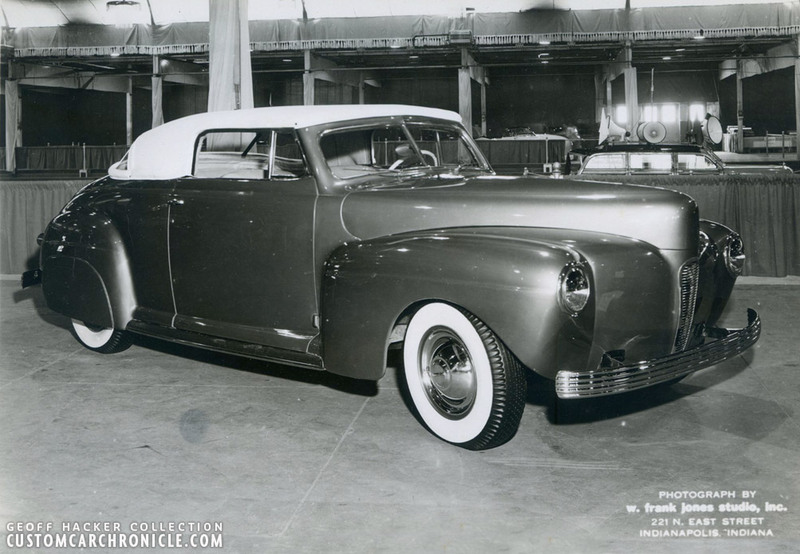 He also added a ‘35 Ford humpback trunk the back and molded in the cut down fenders. The Grill and headlights are late 1940’s Cadillac and bumpers are ’49 Plymouth. The car is still around today. The Collection also included an outdoor photo of the ex-4-door Mercury Possibly the photo was send along with an application to enter the show with the car. Sports Custom restyled by Robert L. Darling of Jeffersonville, Indiana. 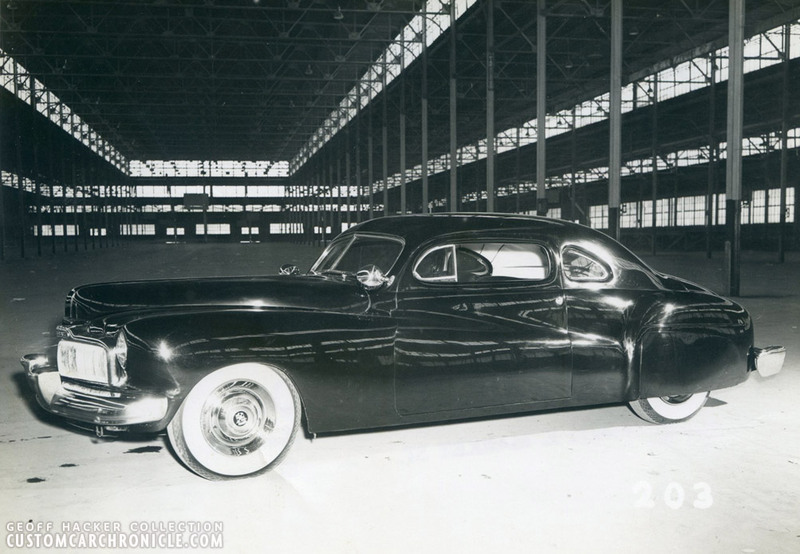 The car was turned into a two-seater coupe with cut down to the belt line -doors and uses body panels from Buick, Chrysler and DeSoto. Car is also still in existence today. R&C editor Spencer Murray drove his Link Paola-chopped ‘49 Chevy all the way from Glendale, California. 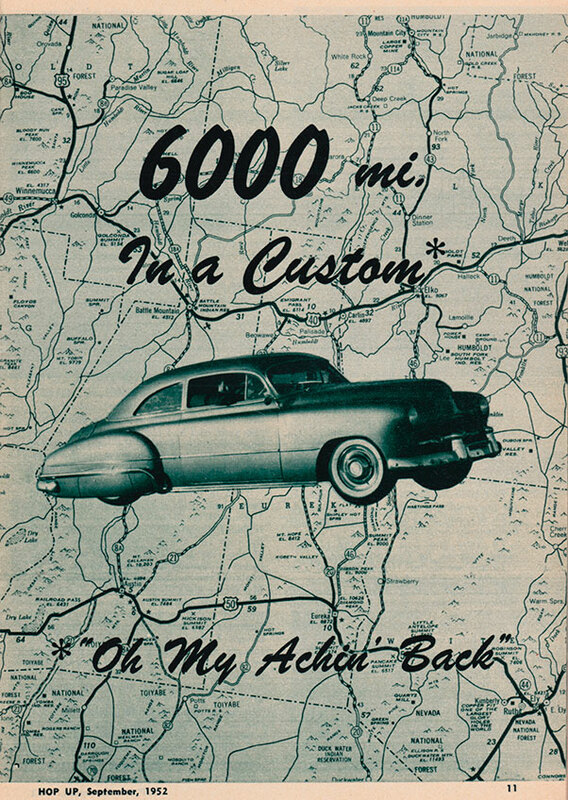 He wrote a story about the 6000-mile trip in the September ‘52 issue of Hop Up Magazine. Openings page of the September 1952 issue of Hop Up magazine article on Spence Murray’s 600 Miles in a Custom trip to the Indianapolis show and back. 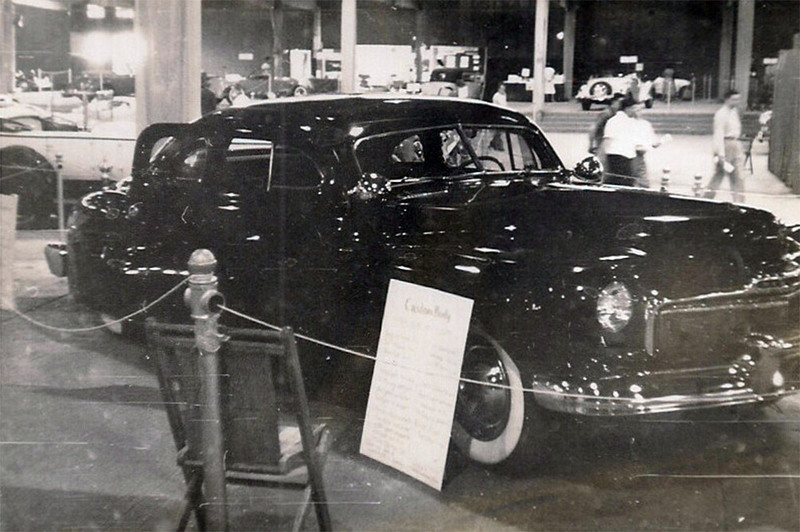 The ClarKaiser shop created this stunning ‘48 Mercury coupe for Leo and Adele Volpe. The car was sectioned, chopped and had full fade away fenders, as its most obvious restyling. This photo was most likely taken for promotional purpose before, or after the show. The Volpe Mercury during the show. Obscure looking car created from a whole list of car parts and home fabricated panels. Has Mercedes star on the radiator. Typical home build car inspired by the Sports Cars of the time. 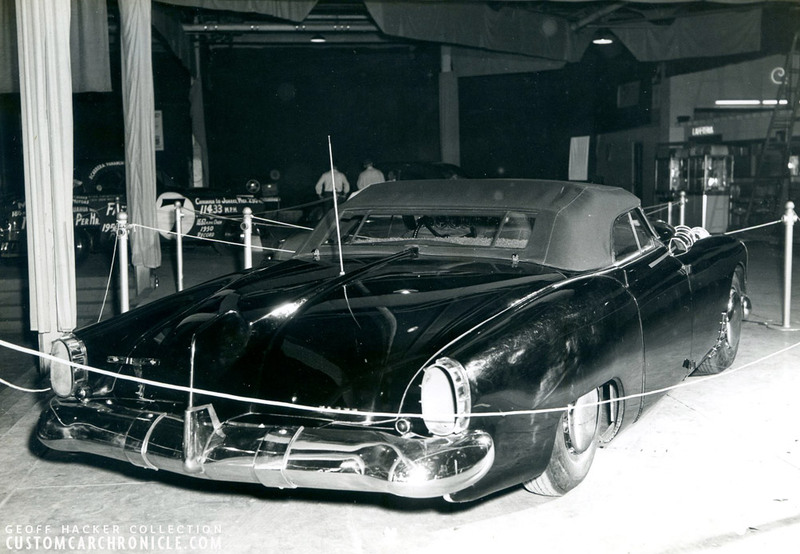 Same car as above at the ’52 show. The airplane white wall tires are now replaced by black wall tires, and a soft top has been fitted. 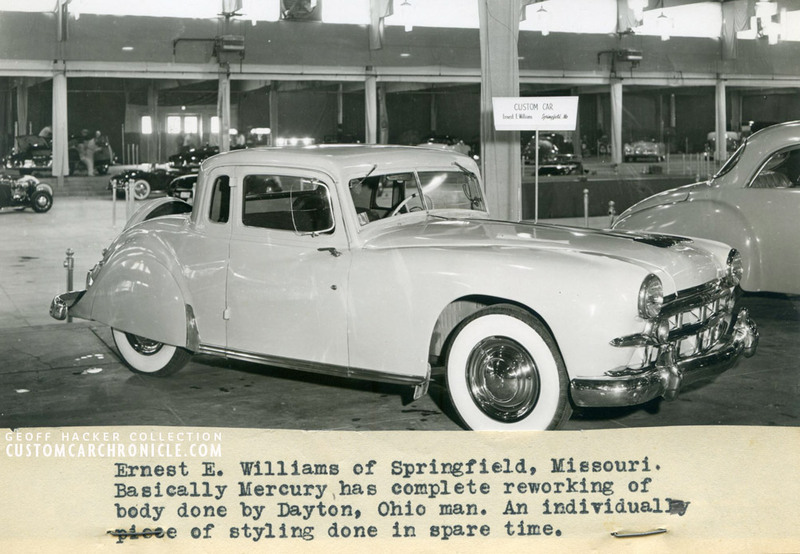 Thomas Douglas brought his sectioned and molded Shoebox Ford from Miami Florida. The car has a beautiful proportioned all modled-in body with speed boat style windshield. 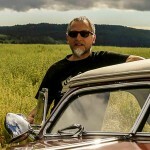 The car has a very interesting mix of Sports Custom and regular Custom restyling. 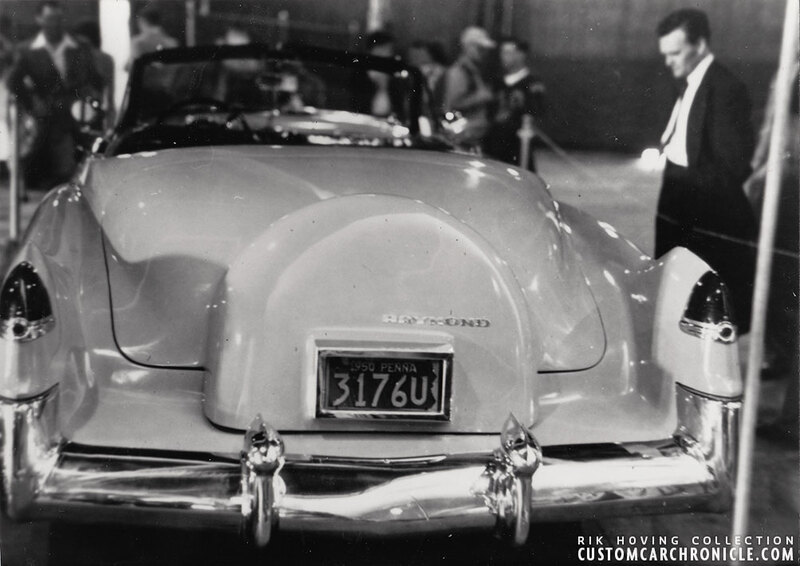 The molded in trunk incorporated a recessed license plate including fancy chrome plated surround. The whole plate units was hinged from the side to give access to the hidden gas filler pipe mounted in the center behind the license plate. 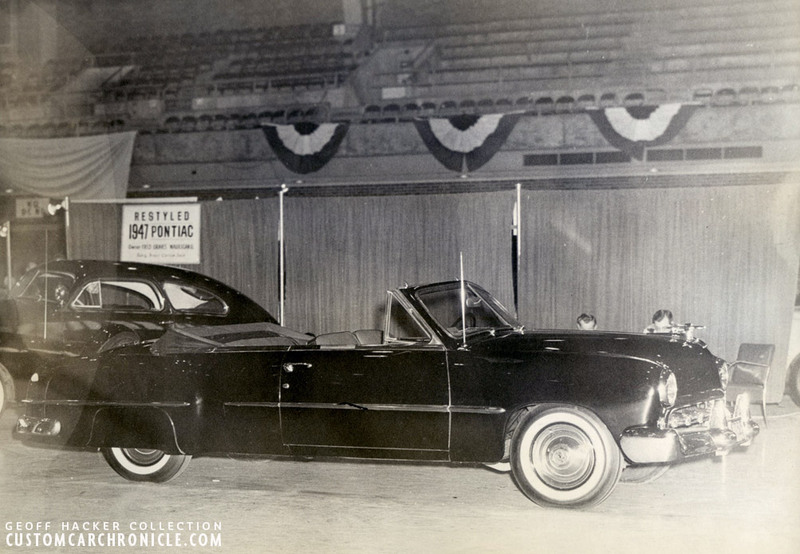 Larry Ernst brought his Barris Kustom Restyled 1951 Chevy from Dayton Ohio for the 1952 Show. Fully detailed ‘ 32 Ford with dressed up flathead engine with three carb. 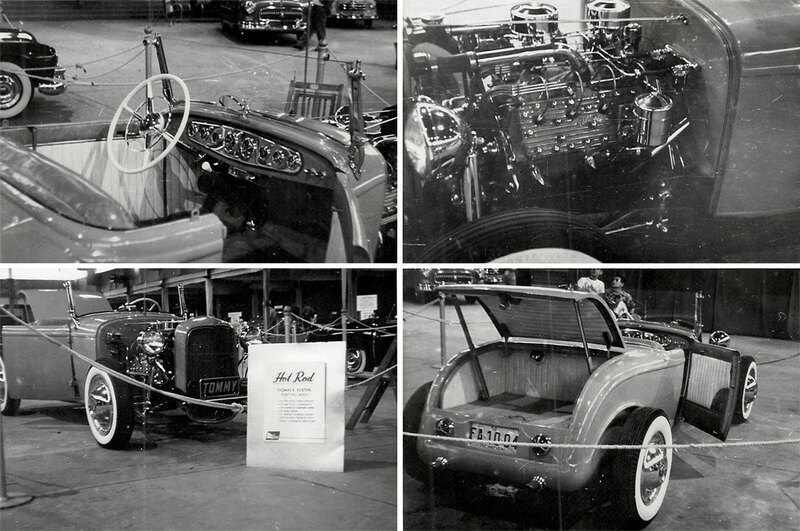 intake manifold displayed at the 1951 show. Heavily channeled full fendered Model A Hot Rod with ’32 grille. Another channeled Rod at the show. Completely detailed inside and out. The Sombrero hubcaps on wide whites give it a bit of a Custom feel. J. 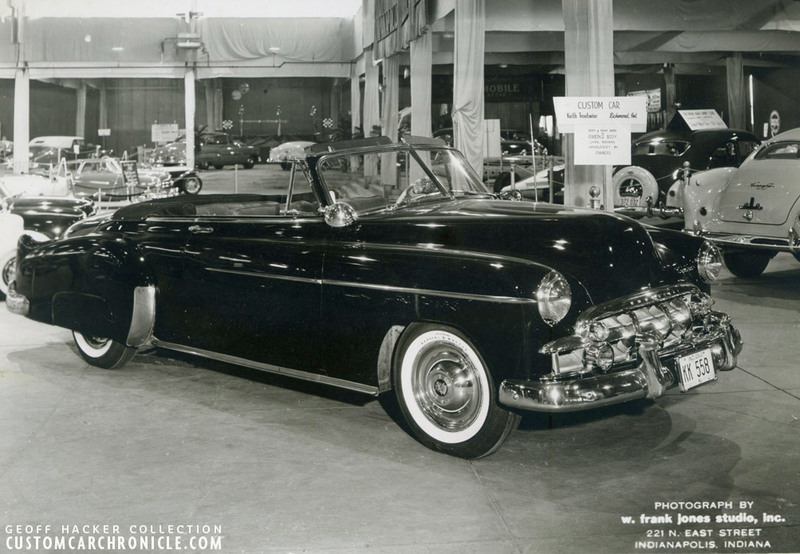 A. Wright of Covington, Va brought his 4 inch sectioned ’49 Ford convertible to the show. 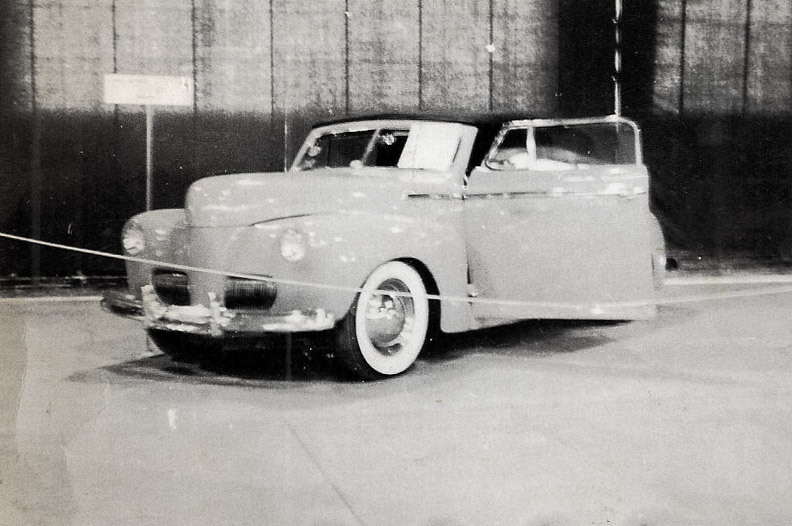 This front 3/4 view photo of the Wright sectioned Ford shows the use of Mopar rear fenders, and Custom grille using Lincoln units. Unusual for this type of full custom are that the hood ornament, and door handles remained on the car. Typical for this part of the country is the addition of the Continental spare tire kit at the back. 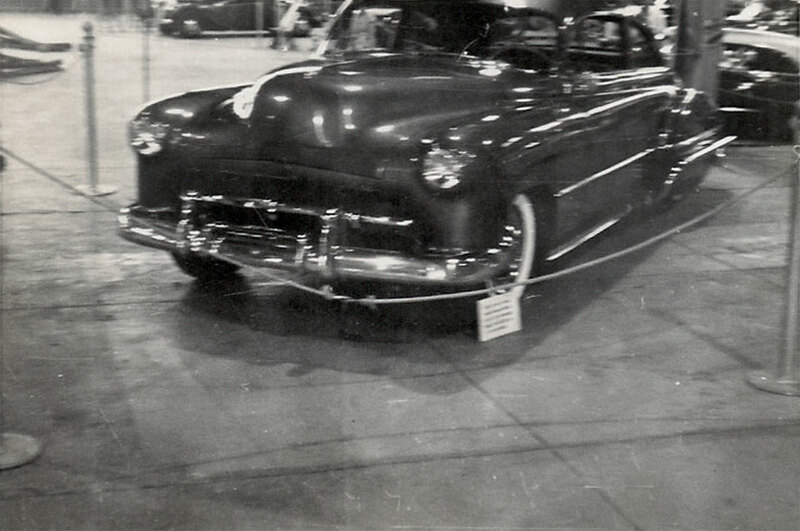 A bit fuzzy snapshot of a very elegantly done 1941 Ford convertible with chopped padded top, smoothed center grille and ’46 Ford bumpers. All Styling elements so typical for the early California style Custom. Based on a 139 Mercury chassis the front and rear fenders are also very recognizable as Merc units with Full Fade-Away’s added. Hood looks to come from a 40’s Buick. The grille was all home made in stainless steel by owner Ray Zuend. The description of this Wild Rod/Custom reads that it is basically a Mercury, but perhaps that is for the frame and engine. 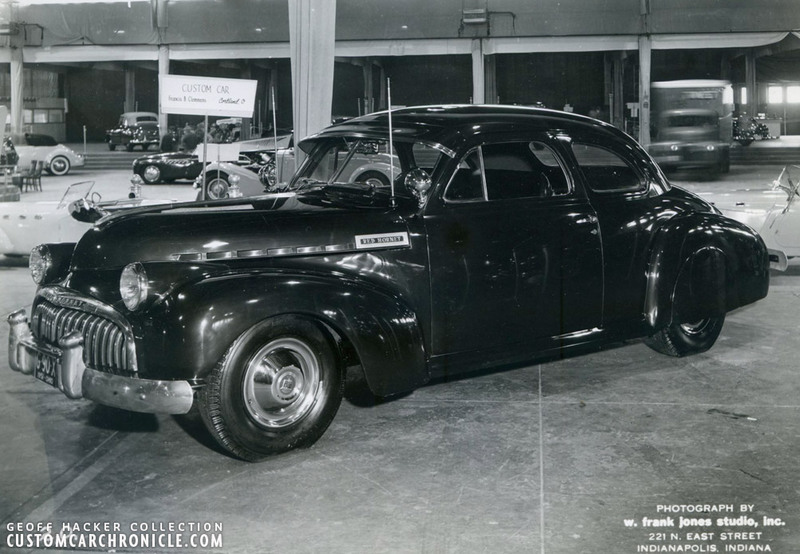 The body looks to be based on a 33-34 Plymouth or something similar, with widened body and later model front and rear fenders molded into the body. The grille looks to be from a ’49 Cadillac. 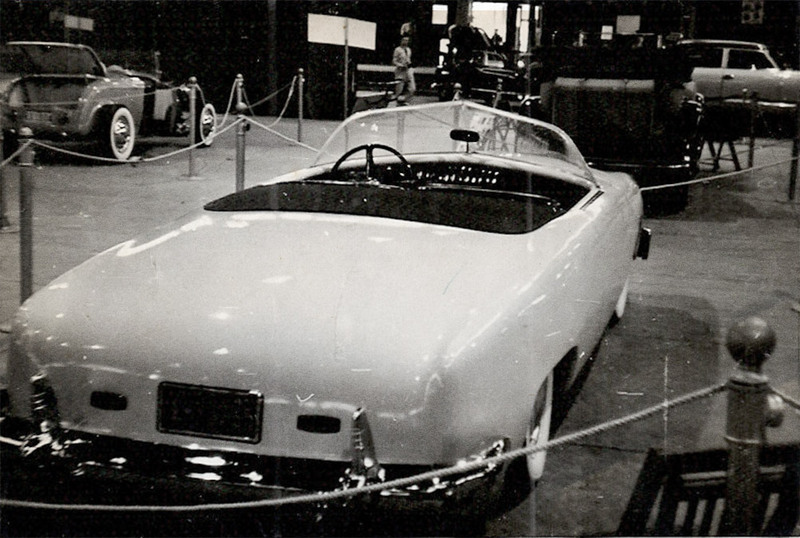 Unusual Convertible with simulated wrap around windshield, Smoothed body seems to have been constructed from many body panels from different makes. A lot of work went into this car with some very interesting details as the door handles “hidden” at the end of the side trim. 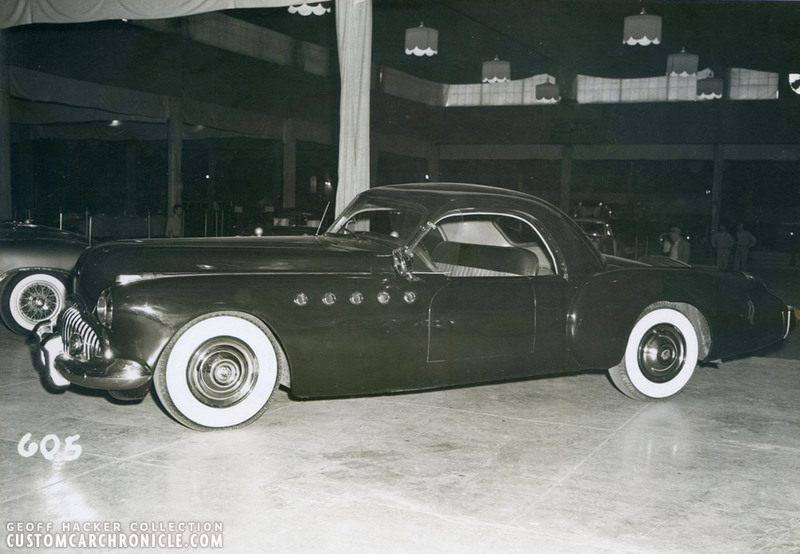 Another Sports Custom looks like it has an early fiberglass hand made body with stylish boat-tail rear end. Francis B. Clemmens from Cortland Ohio, entered this “Red Hornet” 1940 Chevy Coupe that appears to be relatively mild. 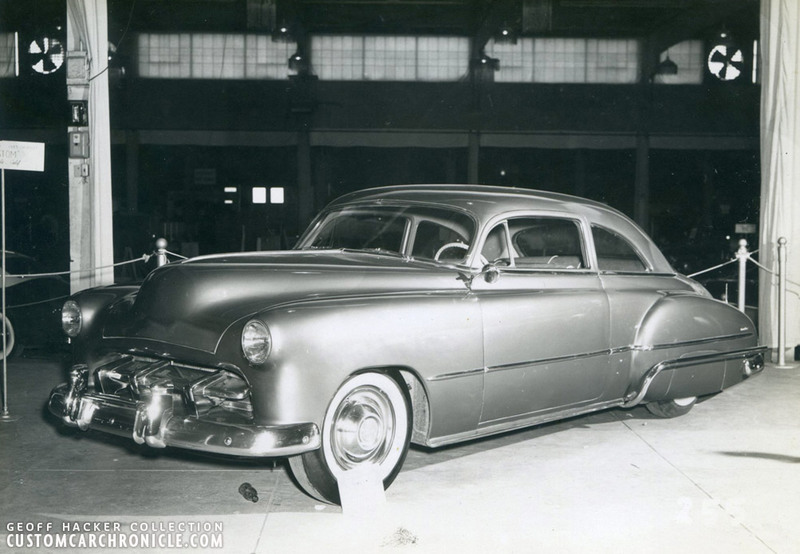 But on close inspection it looks like the body was channeled over the frame, with the front and rear fenders raised, and a new grille surround was created to house a modified 1948 Buick grille. 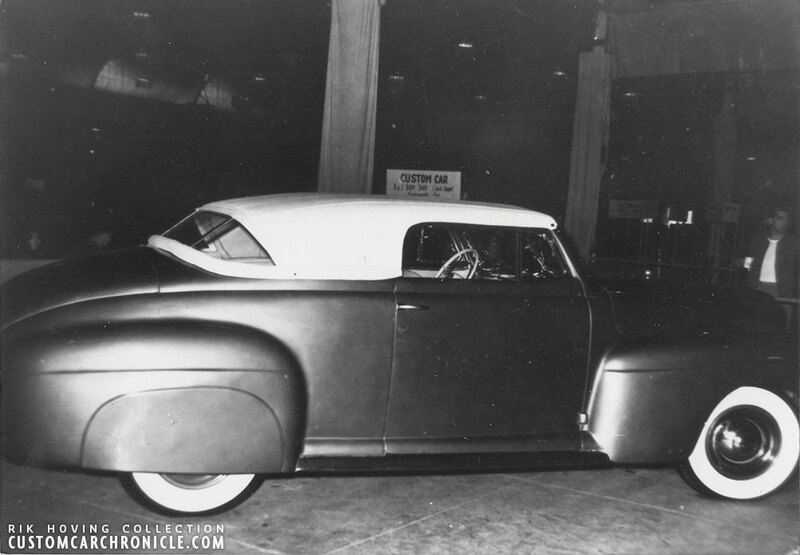 Unusual is the sun-visor, not much seen on Custom Cars back then. Donald White’s 1949 Dodge mild Custom entered by Donald White. Clarence Schaaf of Erlton, New Jersey built this nice looking Sports Custom in his own Schaaf Body Shop. 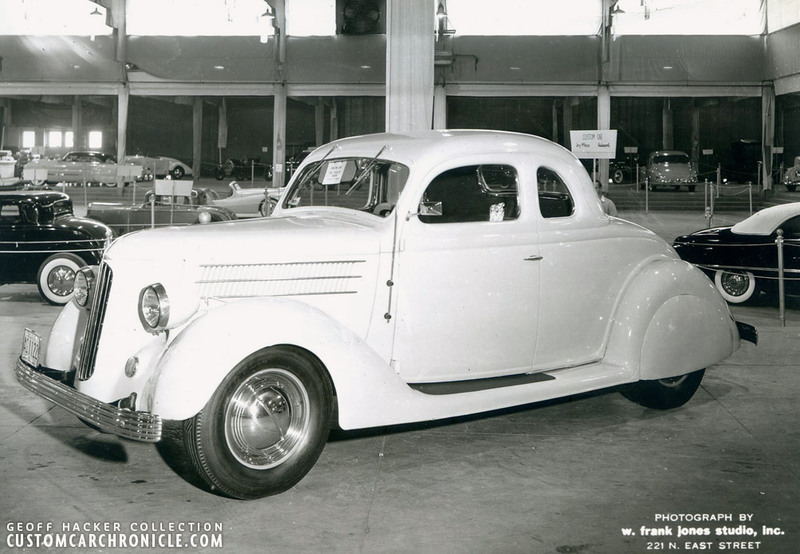 Based on a front wheel driven 1937 Cord chassis. 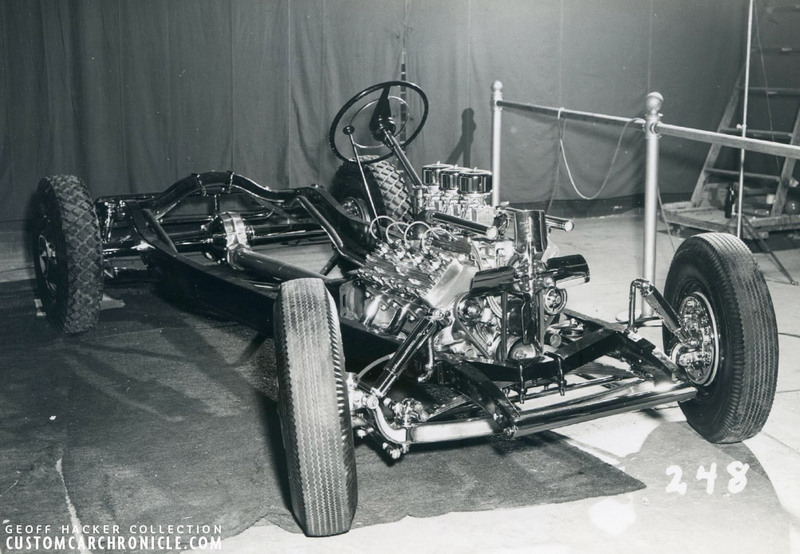 The body was constructed from using body parts of other cars and a lot of hand fabrication. 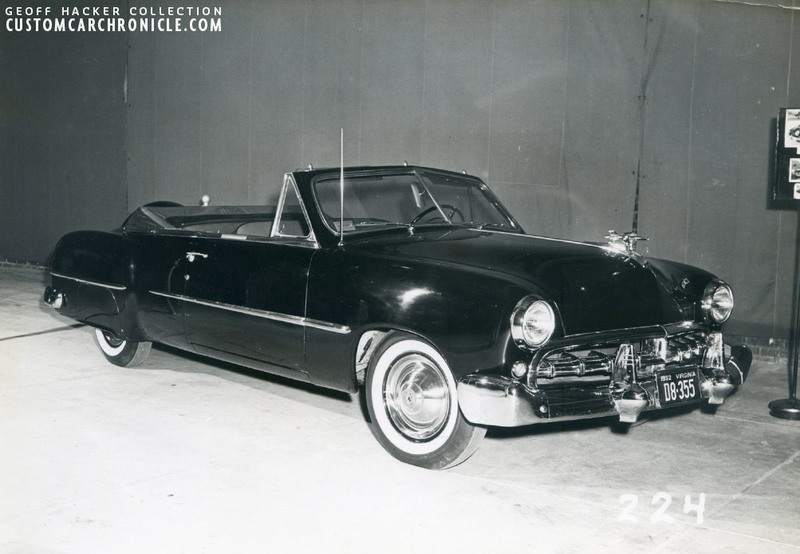 The main parts are 1950 Studebaker front fenders and 1950 Buick rear fenders. The grille appears to have been made of 1950 Buick teeth placed close together. The doors have a “Darrin dip” and are covered with a soft padded top edge done in red and black leather. 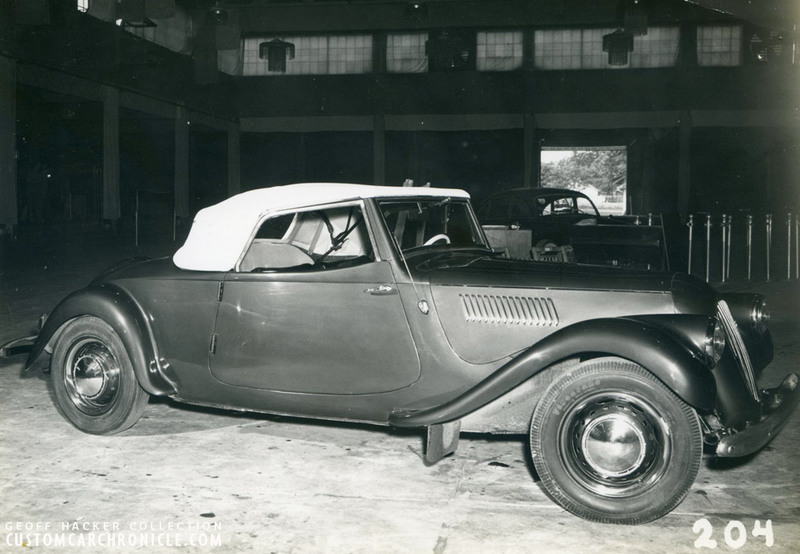 Very unusual is this rare Citroën Traction Avant Convertible with custom headlights, hood sides and grille. 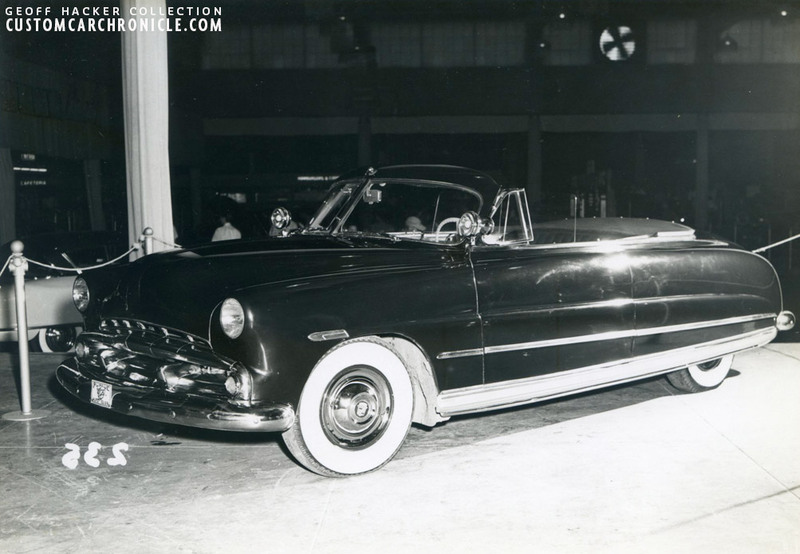 Mildly restyled Custom Hudson Convertible owned by Harry Ghlee Jenkins, Jr of Waukegan, Illinois. Very mildly restyled ’49 Chevy Convertible with Cadillac like rear fenders, Custom grille teeth, spotlights, Sombrero Hubcaps and a mild re-chroming. 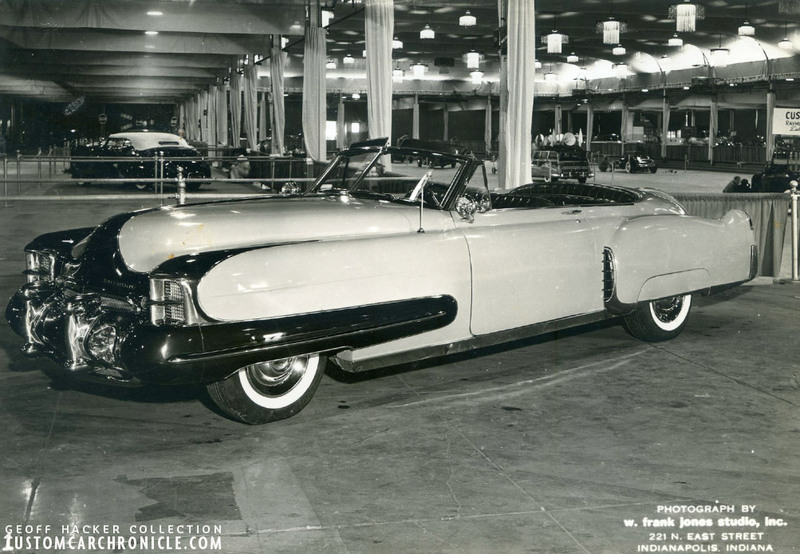 Ramond Jones 1948 Cadillac Convertible with lift off steel top, and very unusual body modifications including molded in double front bumper that wraps around the body all the way to the door, and have the headlights integrated into it. 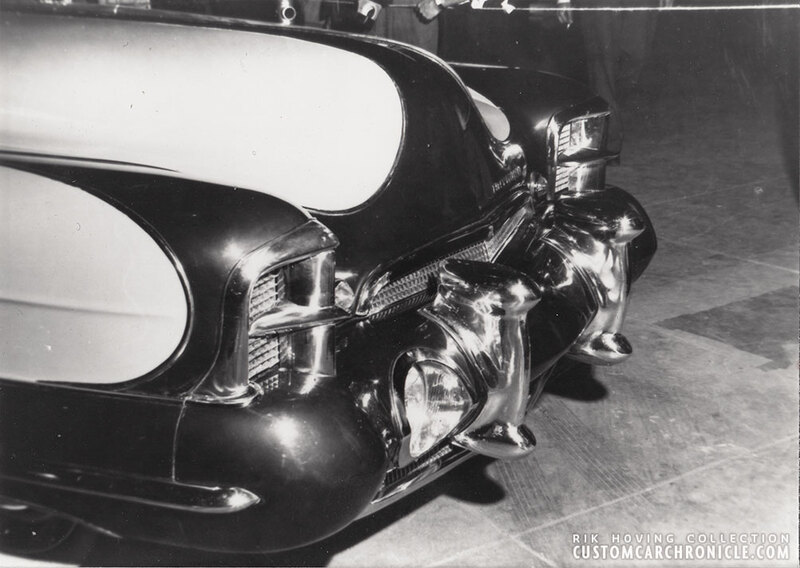 The rear of Raymond Jones Cadillac has extended rear fenders and taillight pods, including 1950 Cadillac taillights. The addition of a continental kit, and extended, molded in splash pan. 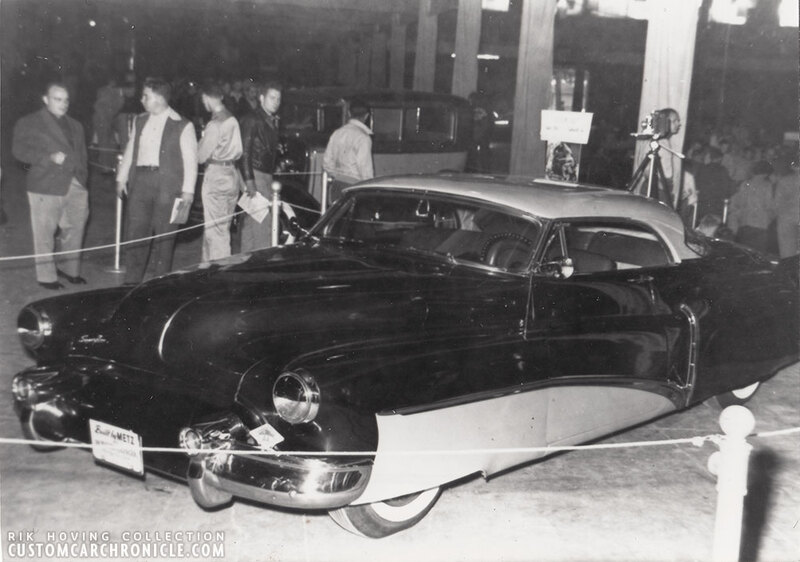 A closer look at the front of the Raymond Jones Cadillac shows how two bumpers, bot with the bottom cut off and then welded together with the bottom one flipped upside down. Even the bumpers guards are doubled up. Scalloped paint is unusual for the time. Famous body man Bob Metz from Shelbyville, Illinois created this 1950 Buick HT Custom from a train wreck for owner Montfort Olinger. 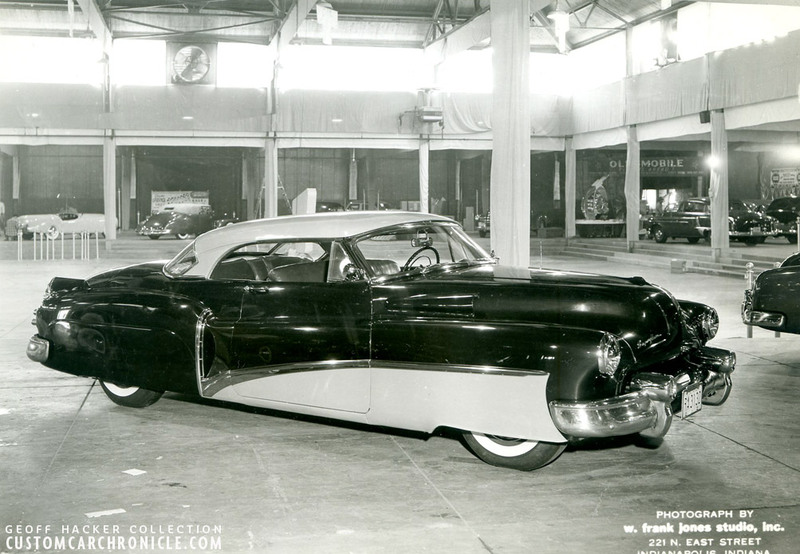 Unusual for the Bob Metz Buick are the fender skirts on the front and the new Buick side trim separating the two colors. Also notice the silver half moon headlight shades. 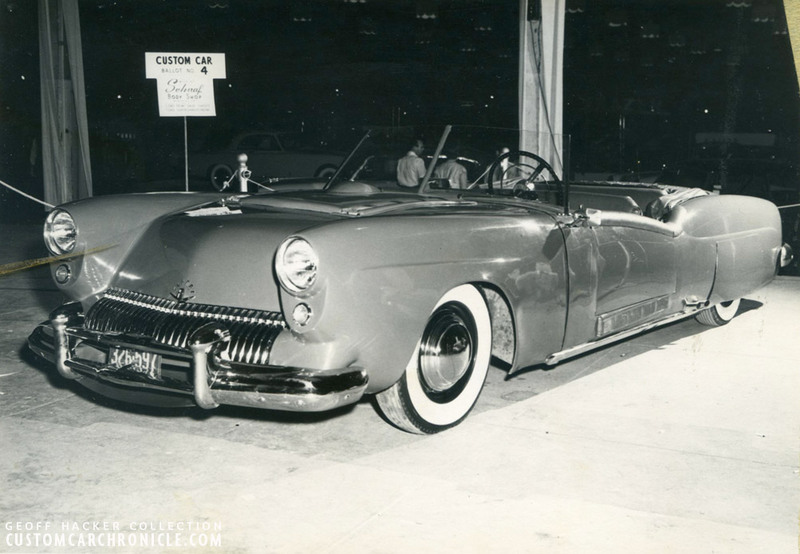 An aftermarket product that was used a lot on Mid-West and East Coast Customs in the 1950’s. Bob’s Buick is still around in drive able condition today. 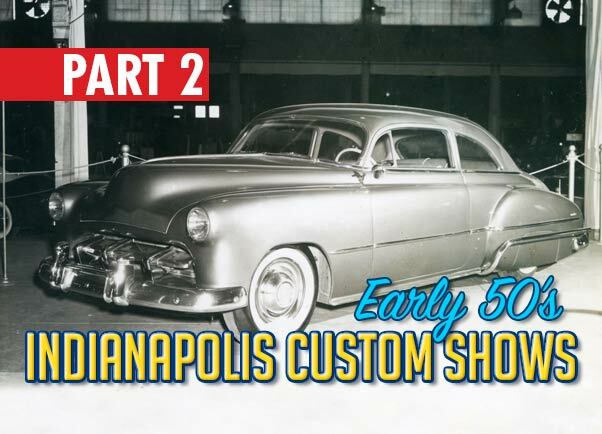 Both the 1951 and 1952 Indianapolis Custom Auto Show were featured in Hop Up magazine. Both both years only on two pages. Great 2 part Story Rik. It’s great to know that some of these cars are still around.. Would be cool to see current pics of them. 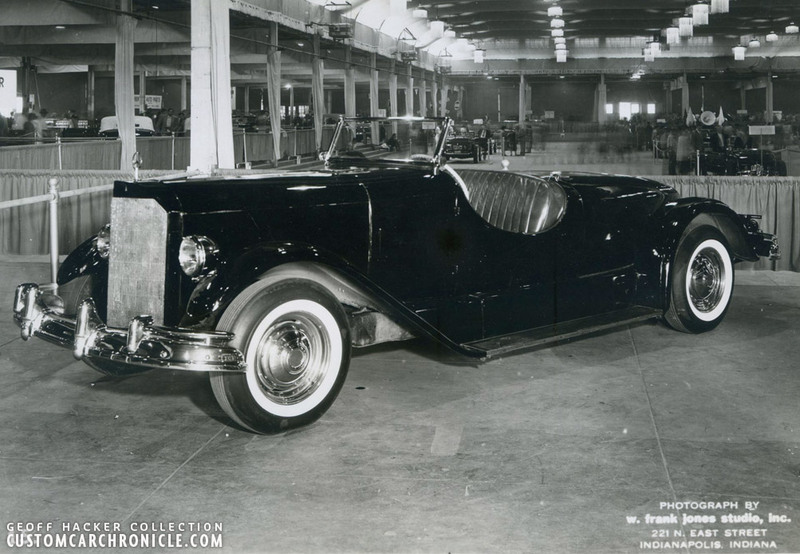 The Cadillac built by Raymond Jones is the same Ray Jones who went on to become a notable restorer of Bugatti’s and many other fine classic cars. Ron Clark of Clarkaiser fame worked for him after the closing of the Clarkaiser shop. Ray’s shop was under his home in Franklin, Michigan. Huge drive-in basement included an upholstery shop. Ray later left the area and was restoring French Bleriot airplanes.